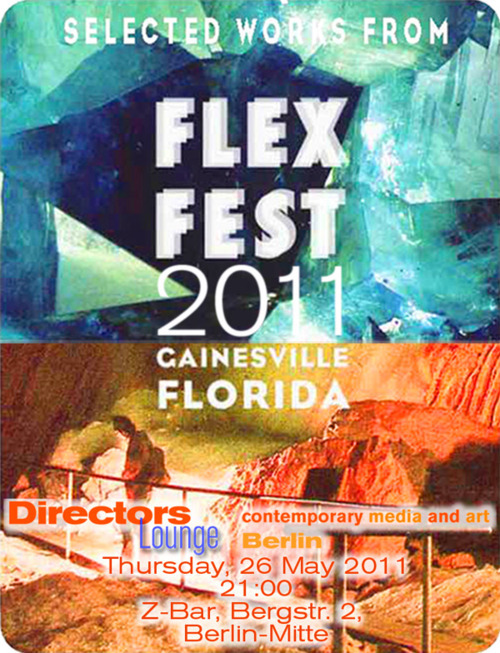 Thursday, 26 May 2011 // 21:00 // Director’s Lounge at Z-Bar // Bergstraße 2 // 10115 Berlin-Mitte // FLEX: the Florida Experimental Film and Video Festival presents a program of highlights from their 2011 biennial competitive festival. FLEX is interested in an expansive notion of experimental media. “Work may draw on documentary, animation, avant-garde, underground, or other traditions—or no traditions at all.“ As such the programming comprises a variety of mediums from 16mm direct animation to found video and from laconic place studies to experimental love poems. Since its start in 2004, Flexfest has become one of the most important festivals for experimental media in USA, challenging us to rethink what ‘experimental’ means. Roger Beebe, who is the artistic director of Flexfest, and who is currently teaching a 5 week workshop at LaborBerlin, will present the program. Roger Beebe will be available for Q&A.